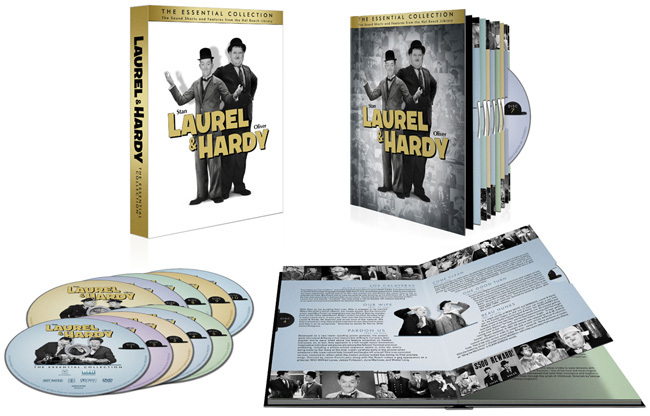 laurelandhardygifts.com produce and supply official licensed Laurel and Hardy merchandise. They hold a worldwide license for a range of products, some of which are exclusive in the UK. As part of their license they have access to 2100 images of Laurel and Hardy including original poster images, stills from their films and some exclusive “behind the scenes” photography. The Laurel and Hardy range of merchandise including tshirts, jumpers, hats, scarves, caps, mugs, umbrellas, aprons, notebooks, postcards, Rubik’s cubes, towels, door mats, keyrings, tote bags, glass wear, posters and framed prints will be launched at Spring Fair 2018. The range also appeals to fans of Friends The TV Series as they sell a selection of merchandise featuring the iconic poster image which is seen in Joey and Chandler’s apartment. The appeal of Laurel and Hardy is still thriving. In the UK Laurel and Hardy movies are currently being screened on Talking Pictures, Virgin 445, Freeview 81, Sky 343, Freesat 306 and Youview 81. Plus they are showing across cinemas throughout the UK including VUE, BFI, Regent Street Cinema and the Falkirk Trust. A new movie is due to be released in late 2018 which tells the story of their final tour in 1953. Steve Coogan will play Stan Laurel and John C. Reilly will play alongside him as Oliver Hardy. The film is produced by Fable Pictures, written by Jeff Pope and directed by Jon Baird. Celebrity fans of Laurel and Hardy include Mark Hamill, Stephen Fry, Matt Lucas, Lee Mack, Rob Brydan, Philip Scoffield to name a few. 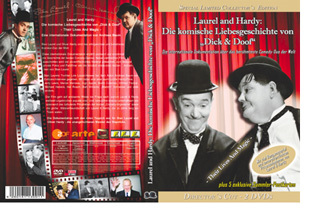 The film is presenting - beside a lot of funny clips from the best Laurel & Hardy movies - a lot of never before published color footage of Stan and Babe and a lot of private photographs, recently discovered archive footage of Laurel & Hardy, rare or unpublished film stills, posters etc. The documentary was shot on location in the USA, Great Britain, France, Italy, Austria, Netherlands and Germany. It is loaded with interviews of Laurel & Hardy experts like Richard W. Bann, Tyler St. Mark, Bart Williams, Chuck McCann and Jim Mac George, Mark Greenhow, Hal Roach, Jean Darling, friends of Stan and Babe like Booth Colman, Jerry Lewis, Marcel Marceau, Comedians. Stan Laurels daughter Lois Laurel Hawes has given the author a very nice and interesting, exclusive interview. That way the documentary is telling the story of Laurel & Hardy very emotionally. You´ll lern a lot of new interesting facts about this famous and worldwide most beloved comedy team - about their work but also about their private lives. This documentary was broadcasted with a running time of 90 minutes very successfully in Germany and France on tv at the beginning of the year at prime time and got a very positive feedback. Now the author is presenting his 15 minutes longer Director´s Cut (switchable in English, German and French language) as well as 70 minutes of unpublished bonus features (switchable in English and German language or with subtitles). "...unquestionably one of the most important releases of the year and certainly the funniest." For more information, please read LAUREL & HARDY VIVENDI PRESS RELEASE ADDENDA by Richard W. Bann. In 1914 Hal Roach began his career as an independent producer, specializing in comedy. Memorable series were built around star names Harold Lloyd, Our Gang, Charley Chase, Will Rogers, Thelma Todd, Harry Langdon, and Laurel & Hardy. Anyone who has seen their work is likely to agree on the importance of preserving these threatened movies for future generations to discover, study and enjoy. Threatened? How could movies like these, so widely seen for so long, be at risk of disappearing forever in first-class quality copies? Because they were too popular. Too many prints and negatives wore out, is the simple answer. Also, unfortunately, the surviving original nitrate elements have suffered decades of benign neglect. Click here to continue reading this essay and learn, among other things, about the last sighting of HATS OFF, and why it will never be found on 16mm; what happened when the fire department came to Stan Laurel's house; who really conceived and orchestrated the whole Buster Keaton revival; what Richard Currier had to do with saving the Laurel & Hardy films; who "The Master Duper" is; and why all the Hal Roach Studios camera negatives were quietly parked by the side of the road in the Nevada dessert. Frustrated fans who know and care about saving and sharing the films have long asked how they can aid in this effort to restore and preserve the battered remaining nitrate, recently deposited at the UCLA Film & Television Archive. Now there is a way everyone can get involved, by donating funds, at any level of participation. Here is the link to UCLA’s new website which explains how you can be involved in the grassroots international fundraising effort: www.cinema.ucla.edu. MISS SEEING THEM ON TV? Here it is. First, who doesn't love these movies? As fans, wouldn't we give anything to have been there when they were being made? And be a part of that history? True it is too late to have been present while the cameras rolled, but all of us can be part of the history of these great comedies. How? We can insure that they survive. That makes us part of the story, and part of the history. Now that's a pretty important part to play. The films can only survive if audiences see them and support them. The next generation of fans needs to be exposed to Laurel & Hardy. That's what it takes. Today, it is sad but true that old films, and black and white films, are being crowded off TV screens. But if someone, anyone, has a chance to sample and choose between something like HELPMATES and the alleged entertainment offered by television programmers today, what do you suppose he and she will choose to watch? The point is, if you petition the TV stations and networks where you live, and ask them to run L&H films, they will. That's their business, pleasing you, the viewer. So write letters, send e-mails. You couldn't make the pies thrown in BATTLE OF THE CENTURY, you couldn't transport the cameras to the MUSIC BOX location, but you really can insure that Stan Laurel and Oliver Hardy will live on to be discovered by new generations including your own great grandchildren. Then use the message board to tell us what happens. Let these folks know what you think, and let us know what happens. I remember after the last previous international SONS OF THE DESERT convention in Amsterdam, people were talking about how the SONS as a large group should be doing this or that, but here's an instance where the fans really can do something important to insure the legacy of Laurel & Hardy. Do you like what you see on TV these days? No? Well, then right now, today, is the "perfect day" to do something about it. In fact as Kay Deslys says to Ollie in PERFECT DAY, "Get going."